You guys, I am SO excited. We are in the midst of planning our first trip to Walt Disney World in the fall for my 40th birthday. I cannot think of a better way to celebrate, can you?? We are avid Disney fans (understatement) and have been to Disneyland multiple times, but this is our first time at the parks in Orlando. PLUS, I am just a little bit excited for all of the Harry Potter stuff over at Universal. I’ll be honest though, planning this trip is a bit overwhelming. I can’t believe how HUGE and VAST everything is. No walking to the parks from the hotels here… unless you’re shelling out the big bucks. We’re trying to decide which hotel to stay at (there are so many) and how much time to spend at each park (there are so many) and which restaurants to eat at (there are so many). So, if you have any tips or advice or opinions, I would love to hear them! Also, if you have any do-not-miss things for the Disney parks and Universal, let me know! 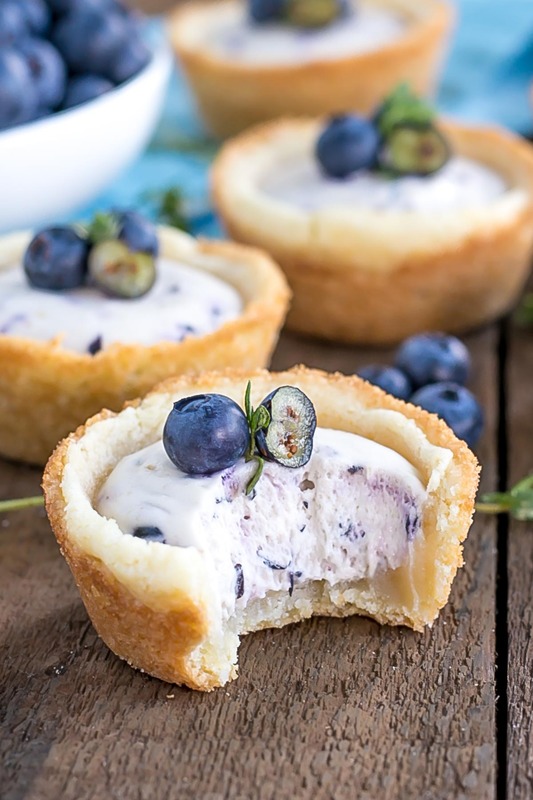 Ok, on to these Blueberry Cheesecake Cookie Cups! It’s been almost a whole two months since I threw a cookie cup recipe at you, so I think it’s time for another. 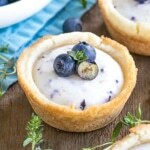 This blueberry cheesecake recipe is pretty much identical to the one for my Strawberry Cheesecake Cookie Cups, except that I halved the recipe and made them with blueberries instead. It’s easy enough to double though, in case you want a larger batch. I had to make the filling for these guys twice because of a stupid mistake. Learn from my errors, people! I made the mistake of adding blue gel coloring to the first batch of filling I made for these. I felt like the natural color wasn’t blue enough and didn’t really pop. Sometimes, natural is better. Sigh. Adding the blue color gel actually turned the filling GREY. WTH right? So I added some purple, thinking that would help. It didn’t, lol. Needless to say, I now have a bowl full of greyish-bluish-purplish blueberry cheesecake filling sitting in my fridge. Good thing it still tastes delicious. Anyhow, you could add coloring if you like, but be warned that it might not turn out how you expect. And you know what? I think I actually like the natural look of these better after all. 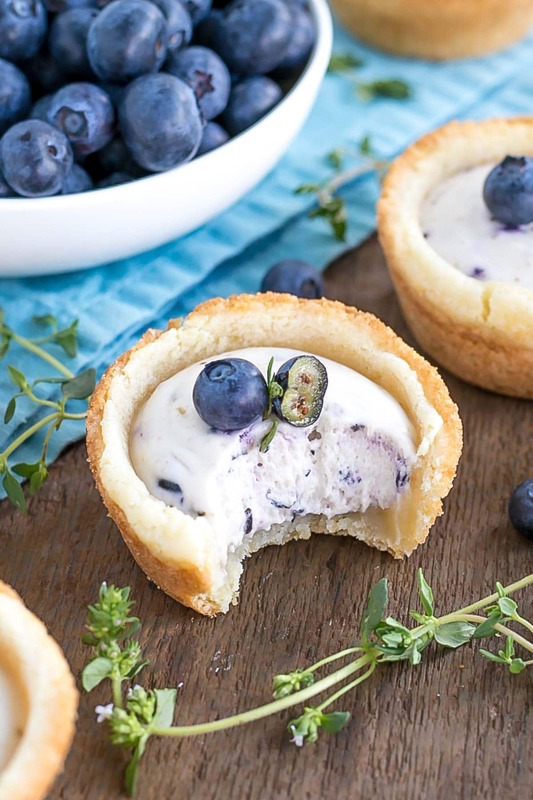 These Blueberry Cheesecake Cookie Cups are the perfect summer dessert. 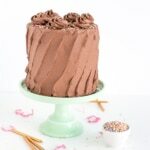 They are easy to make and freeze really well! You know, in case you need to make them ahead of time… or prevent yourself from eating them all in one sitting. You can use a different fruit puree if you prefer. Ensure your heavy cream is cold (ideally the mixer bowl too) as this will make the cream whip up better. The cookies will soften a bit the longer they sit with the filling. These freeze very well! Store in fridge for up to 5 days or in freezer (in an airtight container) for 1-2 months. Best served cold, out of the fridge. 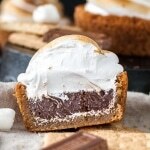 If you like these, check out some of my other other cookie cup recipes! 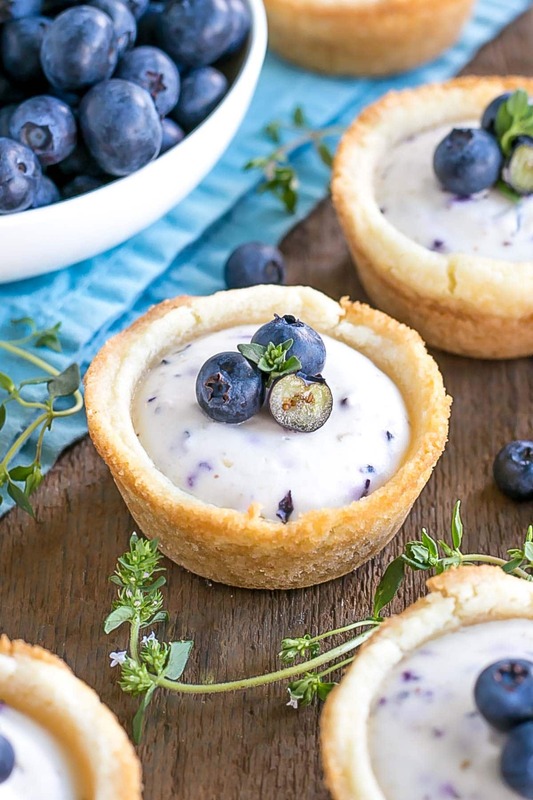 These Blueberry Cheesecake Cookie Cups make the perfect use of those fresh summer berries! Preheat oven to 350°F. Spray a regular sized muffin tin with cooking spray. Whisk together flour, baking soda, and salt, set aside. Beat butter and sugar on med-high until pale and fluffy (approx. 2-3mins). Reduce speed and add egg and vanilla. Beat until combined. Using a large cookie scoop (3 Tbsp), scoop dough into muffin tins, press down to flatten slightly. Bake for 10-12 mins or until lightly browned and mostly set. Remove from oven and immediately use a small jar or container to press firmly down in the center to create a well. Cool in pans for 10 mins, then place on wire rack to cool completely. Fold cream cheese mixture and blueberry puree into whipped cream. Pipe into cooled cookie cups. 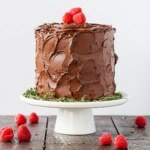 Refrigerate until set (approx. 2 hours). Serve cold and eat within 2-3 days. Or freeze for up to 4 weeks. * 1/2 cup of whole fresh blueberries, pureed. Any adjustments for high altitude folks?! I’m at 7,000 feet!! 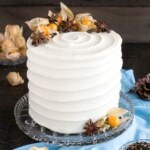 I want to make these for a reception I’m hosting and really want these to turn out perfectly! Do you think I can use thawed frozen berries instead or fresh ones? Hi Eli! You can give it a try. Freezing and thawing berries affects their structure, but since it’s being pureed anyhow it might work ok! I followed the cookie cup directions but my cups are soft, gooey and greasy and won’t hold the filling. Hi Amy! Hmm, no the oven shouldn’t affect it, is it possible they were a bit too underbaked? 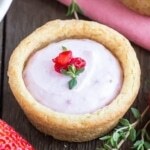 Can you substitute the cookie cups with pastry dough cups? hi! 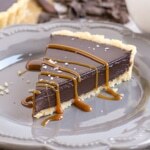 this looks amazing and i’m making it as we speak! your instructions mention adding one egg at a time but i only see 1 egg listed in the ingredients…should it be more than one egg or was that part of the instructions a mistake? Thank you!! I hope your trip was awesome! 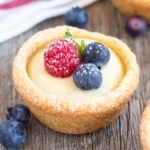 I just made some of these with Mascarpone… you should totally feature them, they’re amazing! Oooh, you’re going to have so much fun at DisneyWorld. My boys are huge Harry Potter fans and we’ve yet to go to Orlando to see the newest HP addition. Have so much fun! 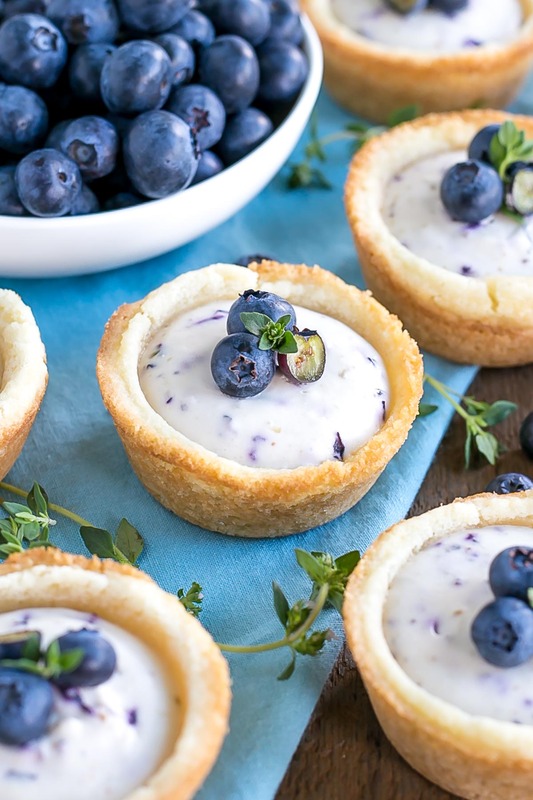 And these blueberry delights look divine! Eeeeeeeehhhh this looks amazing! <3 I love cookie cups. 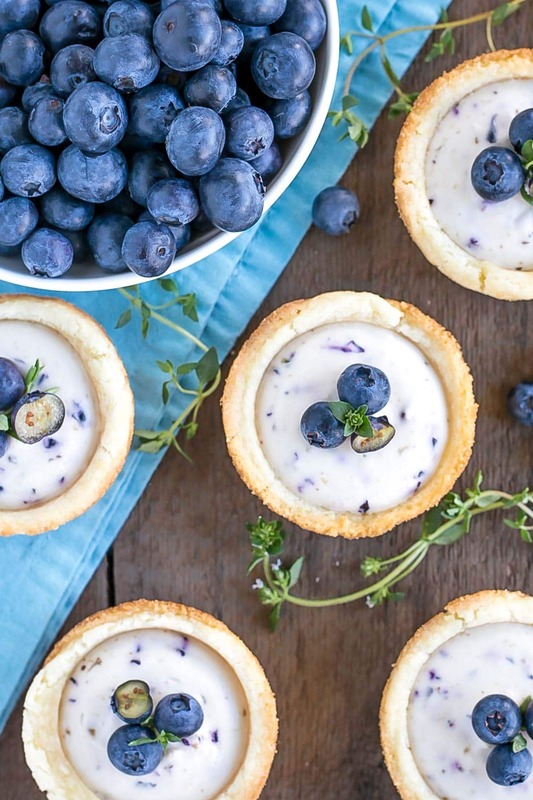 I did a mascarpone cream cheese filling topped with blueberries when I make these…I'll definitely look into doing a fruit puree instead! Hi Marie! It’s fresh fruit that is pureed in the food processor. For this recipe specifically, I used 1/2 cup of whole fresh blueberries and pureed them. 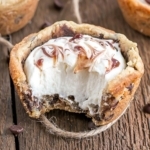 Those cookie cups look gorgeous! Definitely take advantage of the fastpass system at Disney World. For both Universal and Disney, do the more popular rides first thing in the morning or at the end of the day and eat at “odd” times (like lunch at 1 or 11 instead of 12) to beat the lines. And for Harry Potter, buy the ticket that allows you to go to two parks in the same day so you can ride the Hogwarts Express (and make sure to ride it both ways!) Ooh and Ollivander’s is a must. If you’re lucky, you could be picked to have a wand chose you. The wands are expensive but worth it since you can do various charms, etc. throughout Diagon Alley and Hogsmeade. Have fun! Have fun and happy 40th. My best advice is the the single rider line, especially for rides at Universal that are more immersive.